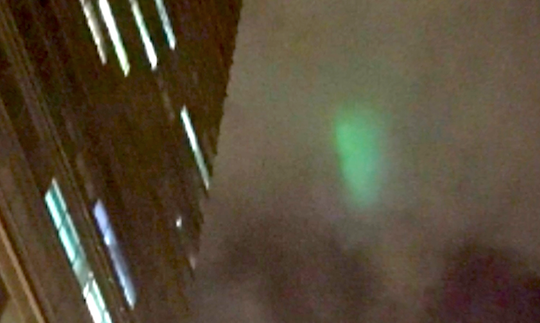 UFO SIGHTINGS DAILY: Green Glowing UFO Over Mexico City On Aug 5, 2016, Video, UFO Sighting News. Green Glowing UFO Over Mexico City On Aug 5, 2016, Video, UFO Sighting News. This UFO was caught by a reporter in Mexico City last week. Its a UFO hiding in the clouds, but its propulsion seems to be making this green glow around it. It is triangle shape. This happens more often than you would think. Somethings they are shooting though the clouds, and they notice you on the ground watching them. They move as fast as lightening, but when they notice you they will either stop for a few seconds, or they will circle the sky, sometimes both right above you. Yes, I have experience such an event before. Galarza journalist Saul captured extraordinary images of a green light in the skies of Mexico City. Located on Madero Street, in the center of the city, he managed to catch the August 5, 2016, around 21:45 hours. Atmospheric phenomenon UFO?